So, What’s The Deal With Cheese 101? We take our mission seriously. We’re here to put specialty cheese at the forefront of food conversations in America. 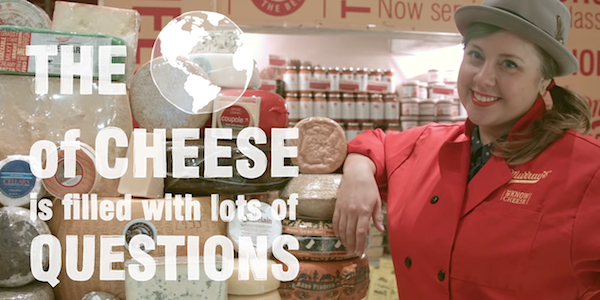 While there is a bevy of cheese information out there, we wanted to make it quick, easy, and most importantly, fun to demystify cheese which led us to the “Cheese 101” video series. Our first four videos covers the basics. From choosing the perfect wedge, the appropriate portioning size, and pairing with the perfect beverage, the videos help guide you through all the facets of buying cheese. Our first two videos are out, but look for “Cheese and Drink Pairings” on 11/19 and “Entertaining with Cheese” on 11/26. Being a real curd nerd takes time and dedication, we hope that this series provides a a brief introduction that you will need to dive into the land of curds and whey. Still feeling a little anxious, and want a little help buying that first round of cheese? Check out our Cheese For Beginners selection, and get it delivered right to your door, or send it to a loved one for a funky holiday gift. You can view all of our 2013 holiday gift collections through our digital Gift Guide. Remember, you can order today, and schedule your delivery closer to the holidays! Want to take your cheese education to the next level? We offer a variety of different cheese classes 6 days a week at our Bleecker street store!